How rare is such a hybrid eclipse? 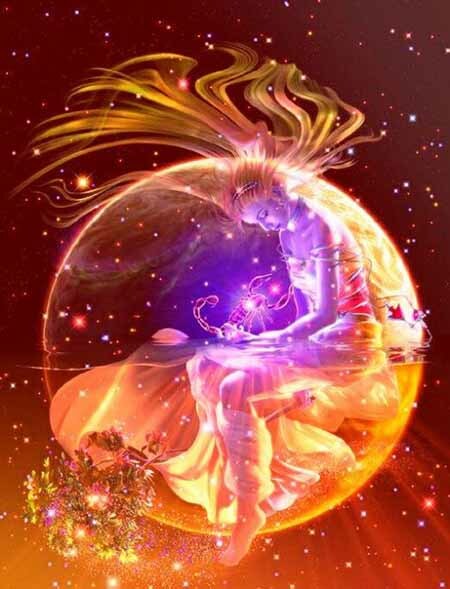 Calculations show that during the 21st century just 3.1% (7 out of 224) of solar eclipses are hybrid while hybrids comprise about 5% of all solar eclipses over the period 2000 BC to AD 3000. Today's hybrid solar eclipse is most widely visible beyond the central shadow track as a brief partial eclipse from northeastern Americas through Africa, and along the track in an annular phase for only the first 15 seconds. A sunrise over New York City rarely looks like this. Yesterday, however, the Sun rose partly eclipsed by the Moon as seen from much of the eastern North American and northern South America. 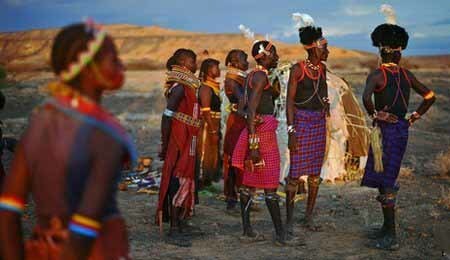 Simultaneously, much of Africa, already well into daytime, saw the eclipse from beginning to end. 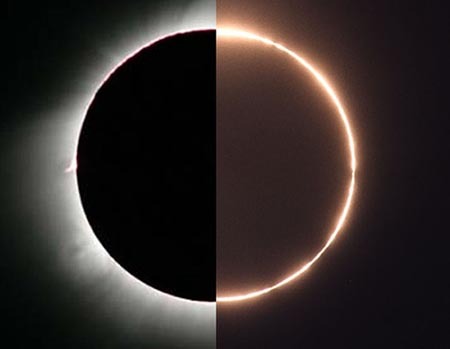 The eclipse was unusual in that it was a hybrid -- parts of the Earth saw the Moon as too angularly small to cover the whole Sun, and so at maximum coverage left the Sun surrounded by a ring a fire, while other parts of the Earth saw the Moon as large enough to cover the entire Sun, and so at maximum coverage witnessed a total solar eclipse. Slight changes in the angular size of the Moon as seen from the Earth's surface are caused by the non-flatness of the Earth and the ellipticity of the Moon's orbit. 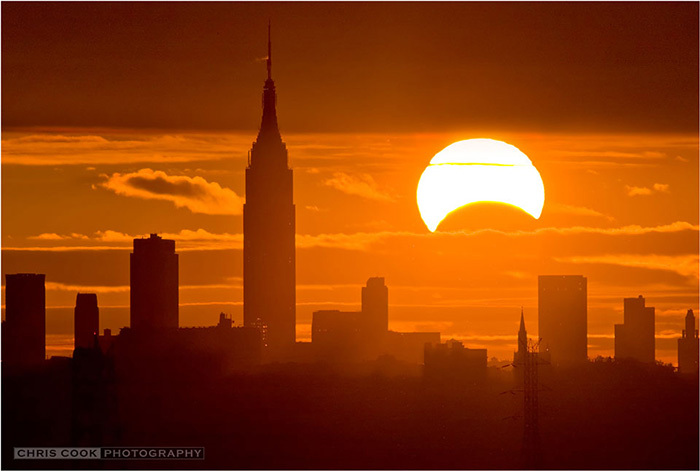 Pictured above, the famous Empire State Building in New York City is seen to the left of the partially eclipsed Sun, adorned with scenic clouds. The next solar eclipse visible from New York City -- a very slight eclipse -- will occur during the sunset of October 23, 2014. 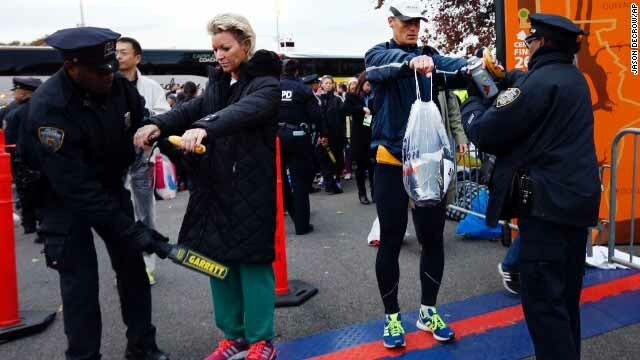 The 26.219 mile race runs through all five boroughs of New York City. Every year helicopters fly over and around the Verrazano Bridge looking for signs of trouble. As this has been a year of ongoing violence in the US, mostly by people who are mentally ill, the security level has increased. From my window, I can see low-flying police helicopters that are so close, I can see inside. 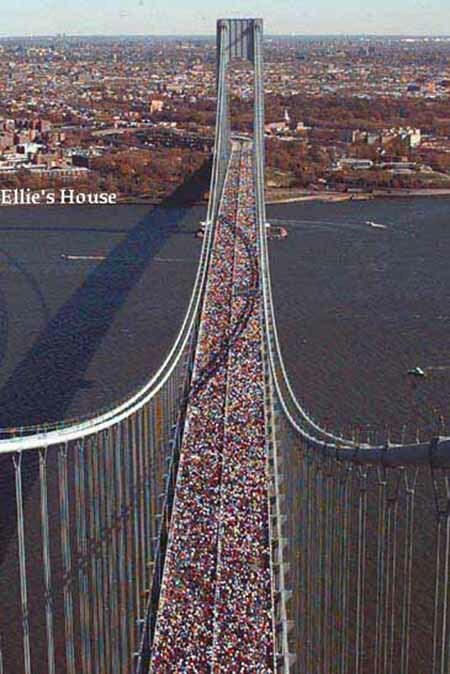 The race starts in Staten Island with runners crossing over the bridge into my area of Bay Ridge, Brooklyn. Though I've been here for 22 years - feeling the vibrations of the bridge and the energies of the runners as they cross over - is always exciting. Diwali symbolizes the victory of good over evil. Lamps are lit as a sign of celebration and hope for mankind. 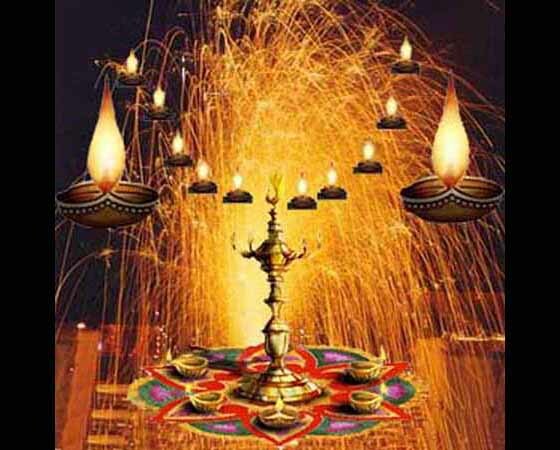 Celebrations focus on lights and lamps, particularly traditional diyas.